How fast can you run in stiletto heels? Brilliant! A race I could win. In the name of fashion, 150 women strapped on stiletto heels last week and ran through a shopping district in Amsterdam, competing for 10,000 euros of shopping money ($11,900, as of this morning). 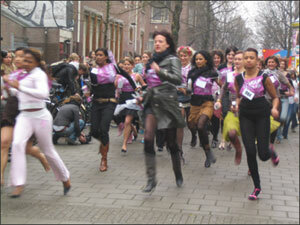 The Glamour Stiletto Run was a promotion for the international magazine, which was introduced to the Dutch market in September. If it seems crazy that 150 women could run in heels, consider that 4,000 applied for the privilege, and only the lucky few were selected. The contest was open to women only, and minimum heel height was 2 and 3/4 inches. A nimble 20-year-old named Nancy Karels won, and no snapped ankles or personal-injury lawsuits were reported.